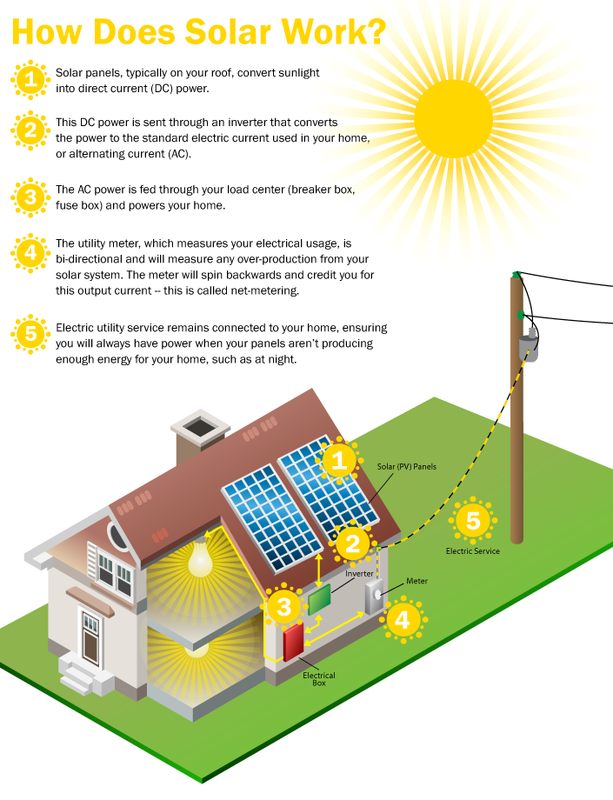 Solar panels, typically on your roof, convert sunlight into direct current (DC) power. This DC power is sent through an inverter that converts the power to the standard electric current used in your home, or alternating current (AC). The AC power is fed through the load center (breaker box, fuse box) and powers your home. The utility meter, which measures your electrical usage, is bi-directional and will measure any over-production from your solar system. The meter will spin backwards and credit you for this output current -- this is called net-metering. Electric utility service remains connected to your home, ensuring you will always have power when your panels aren't producing enough energy for your home, such as at night.